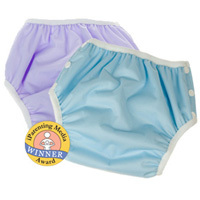 Cloth training diapers consist of an outer layer of either cotton or polyester and a soft absorbent inner. Trainers with cotton outters will usually have a hidden layer of PUL. Cloth trainers are made to look just like underwear, but with the PUL or polyester they keep accidents in. They often come in cute prints, which will help your child become excited to wear them and feel just like a big kid. There are different levels of protection that a trainer can provide. Some trainers are meant for children just learning to use the potty, while others are made for children who are using the potty with occasional accidents. You will need to make sure you find the right training pants to accommodate the stage of potty learning your child is in. If you need more absorption in a trainer, you can find them made with terry, bamboo or even microfiber. A cloth training diaper is not made to be as absorbent as a diaper because it's assumed you will be guiding them to the potty often. One of the advantages to cloth training diapers is that they will help your child feel wet when they pee in them, unlike disposable trainers. Disposable pull-ups are very absorbent and will not encourage your child to want to use the potty. Not to mention they are very costly and if you buy a small supply of cloth trainers, you will save a lot of money. Cloth trainers can cost anywhere from $10-$20 and possibly more, depending on what materials they are made with. The most basic trainers made with poly outters and terry inners are the least expensive. You don't need a fancy trainer with bamboo or even cute prints, as long as you have a comfortable fit and just enough absorbency for one accident, it will get the job done. If you are very consistent with taking your child to the potty very often, you can even use the Gerber training pants. They are not absorbent enough to hold an accident though. If you need more absorbency for night time, or even for long car trips of naps, a pocket trainer or over night trainer will be a good choice. Over night trainers are made to be more absorbent than day time trainers so they will contain much more. They are made so your child will still feel wetness though, so you can continue to encourage them in using the potty. Pocket trainers are made with an outer water proof layer and an inner of microfleece. The fleece will help your child feel dry, so these trainers are probably best for over night use or long trips where you don't want your child to feel wet. With the pocket you can customize absorption so they can hold as little or as much as you want. There are two styles of cloth training pants. Those that pull on and off and those that fasten with snaps(or possibly velcro). There is one thing to consider when choosing which type of trainer to use. If your child has not learned to go #2 on the toilet yet, then it will be difficult to remove a pull on trainer filled with poop. You will have to figure out a method to remove the pants without the poop falling out before they are pulled off, or without it rubbing onto your child. Snap on trainers usually have side snaps and when your child gets older you can unsnap on hip snap and then pull them down like a pull-up. That's a nice advantage that makes them have a longer range of use I think. I think the cost of cloth trainers is well worth it, as long as you are sure your child is ready for potty learning. If your child is showing all the signs of potty readiness, including using the potty, I would definitely recommend cloth trainers. 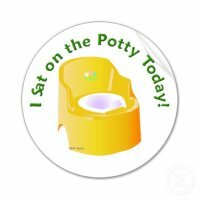 They will encourage your child to move forward in potty learning and help them feel like a big kid.